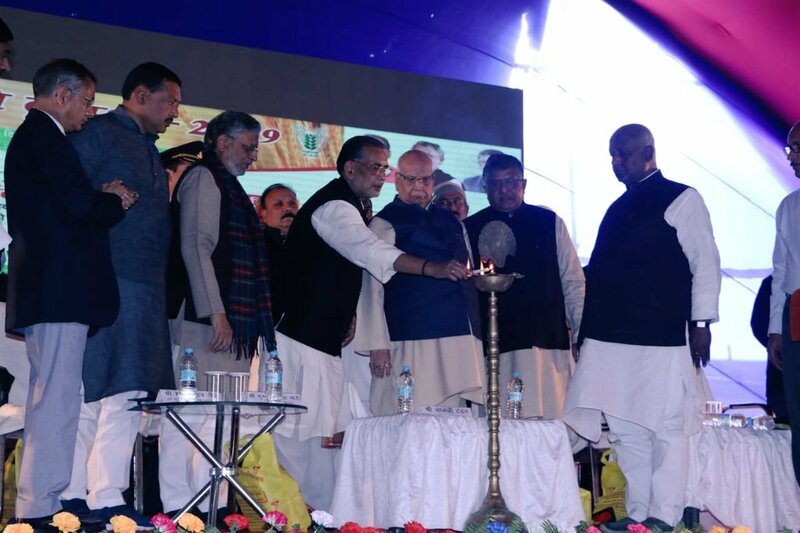 Bihar Governor Lalji Tandon and Union Agriculture Minister Radha Mohan Singh jointly inaugurated the three -day Krishi Kumbh in here today. Fifteen thousand farmers from different states and about two hundred agricultural scientists are participating in the Kumbh. The objective of Krishi Kumbh is to promote modern techniques and diversification in agriculture that could help in doubling farmers income. Addressing the function Union Agriculture Minister Radha Mohan Singh said the government is committed to doubling the income of farmers by 2022. Mr Singh said the government is creating strong infrastructure from “Beej to Bazar” for enhancing the income of farmers. He said the government is focusing on providing institutional credit at nominal rates to farmers through Kisan Credit card. Union Agriculture Minister Radha Mohan Singh has sought the support of state Chief Ministers for the effective and speedy implementation of Pradhan Mantri Kisan Samman Nidhi( PM -KISAN) to ensure expeditious transfer of benefits to farmers. He said the committed involvement of administrative machinery is essential for the timely implementation of the PM- KISAN scheme.